No need for picture on cooked scallops, I am sure they are delishisous:):)i can almost taste them.i love the little bay scallops too,they are tender and sweet in one bites. In Masbate, we can get them for as low as 80 pesos. That’s what I miss about the province. All this sea shell posts and red tide warnings is not helping my seafood craving! 200php for deshelled and cleaned scallops is a really good deal. Why not a seashell menu for Zubuchon? Oh I so miss eating scallops in Bacolod! For me and my husband Imay’s has the best scallops. I’m drooling right now. There was a Jamie Oliver show where his friend gathered scallops, which were made into an appetizer in the kitchen a few minutes later. I was fascinated by how scallops ran away (open-closed away?) from their predators. No wonder those adductor muscles grow so large! Sorry, didn’t get a photo of the final product, I was busy eating. :) … Good. I won’t be so envious then, hahaha! Since they are just the adductor muscle of the seashells, what do they do with the rest of the body? 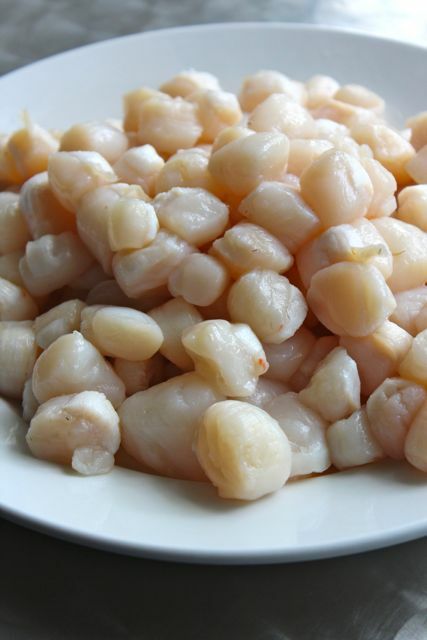 They must accumulate tons of them as by-product of the dried scallops industry in China. Chinese restaurants here usually cook just these expensive and delicious dried version more than the fresh ones but when they do, they cook the whole thing and serve them in their pretty shells. They look like mussel meat inside. And the shells, what do they do with the beautiful shells? In Spain they are linked to the pilgrimage to Santiago de Compostela to which the French also refer since they call them coquilles Saint Jaques. Btw, madeleines, those shell shaped cakes made famous by Proust’s dunking of them are also linked to the same pilgrimage. wow, large ones! how much were they, MM? they are plentiful around the visayas, where local restaurants usually serve them baked in the shell with plenty of margarine and garlic. but it’s rare to see “cleaned” scallops like these (meaning, just the adductor muscle). your recipe sounds delicious, although i probably would have thrown in some chopped chives (sorry, just jubilant over a surfeit of flowering chives in my backyard garden!). wish i could find scallops like these here. The rest of the mussel is called the coral, it is orange – red and quite delicate. Here in France the whole mussel is usually served, especially in the shell. When very fresh they are even eaten raw. Last week I ate a fantastic dish of mussels in a local restaurant ( quite ordinary, but we are on the sea here ) just quickly fried in butter, served with a beautiful slab of still trembling fois gras…it was amazing. And no, artisanal fois gras raised by traditional farmers does not traumatise the animals. Some shops here sell craft items made with the shells, just like in the Phils, mirror frames, lampshades, etc…The shells are associated with Santiago de Compostela because the boat on which St James (Santiago) landed – miraculously – was supposedly covered with them. We dined at Carrabbas Italian Grill and had the best tasting 3 giant scallops on a bed of delicious orzo. So tender, sooooo delicious, I ordered another serving ($18) to take home. Last week I was in a great big seafood market so I bought some big scallops (7 pcs in a pound for $12). Used my Le creuset and cooked them 4 at a time for 2.5 minutes each side. Turned out so tender and so delicious too. Love, love, love scallops!! Saw a documentary that these are farmed in Bohol! scallops. japanese call them hotategai or tairagai. 6 or 7 years ago, Bay-ad(placuna ephippium) was so plentiful in Iloilo, we used to buy them by the sack!! we grill them til the shells open and off the coals they go..Now, we could only buy them from the restaurants–for a high price!! they are delicious. Hello. I saw in cold storage’s website that they sell half shell scallops (sunmoon/lampirong). I wonder if I can grill that on the half shell with cheese, butter and garlic. Thanks in advance.